This toy test was done in Isabelle's daycare. It is in fact a three-dimensional puzzle. 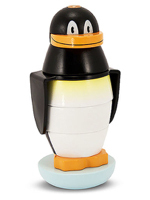 This toy is sold on the Educatall online store: http://www.educatout.com/catalog/product-penguin-stacker-wooden-toddler-toy_i-1177.php. This is a cute little penguin that children will enjoy assembling. It contains 8 pieces, 7 pieces are made of wood whereas the penguin's wings are made of plastic. The base includes a wooden dowel. 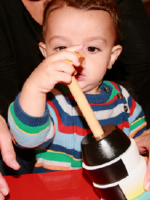 Children must slide the pieces onto the wooden dowel one by one. The children in Isabelle's group showed great interest in the penguin. They had fun assembling and disassembling it repeatedly. Since the penguin is almost completely black and white and there are no visual references, assembling the penguin perfectly represents a challenge. Personally, I feel this toy is interesting nonetheless. In a way, the fact that younger children may place the penguin's feet in the centre of its body makes it even more adorable. The manufacturer recommends this toy for children 18-months-old or older. If you have no expectations and simply let children assemble the penguin any which way, I think this age is perfect for this toy. 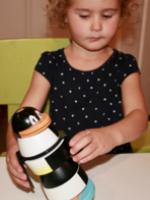 In fact, with a little supervision, younger children can also manipulate the Penguin Stacker. The pieces are quite big and they have rounded edges. My only real concern is the wooden dowel. The manufacturer mentions that the toy's base allows the penguin to waddle. Unfortunately, we found that the toy did not rock as we expected. I am a fan of the Penguin Stacker. I like wooden toys and this one is well-made. It is very cute and looks great on a shelf in a playroom when it isn't being used. The parts are a good size and therefore easy to manipulate.